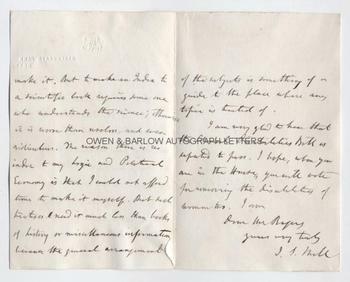 JOHN STUART MILL Autograph LETTER Signed. Together with a good contemporary portrait photograph. British political economist and philosopher. ALS. 3pp. Blackheath Park, Kent. April 2nd 1870. 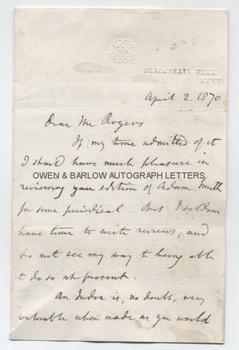 To Mr. [James Edwin Thorold] Rogers. "If my time admitted of it, I should have much pleasure in reviewing your edition of Adam Smith for some periodical. But I seldom have time to write reviews and do not see my way to being able to do so at present. An index is, no doubt, very valuable when made as you would make it. But to make an index to a scientific book requires someone who understands the science; otherwise it is worse than useless, and even ridiculous. The reason there is no index to my Logic and Political Economy is that I could not afford time to make it myself but such treatises need it much less than books of history or miscellaneous information because the general arrangement of the subjects is something of a guide to the place where any topic is treated of. I am very glad to hear that the Clinical Disabilities Bill is expected to pass. I hope when you are in the House you will vote for the removing of disabilities of women, too." 8vo. Approx 7 x 4.5 inches. 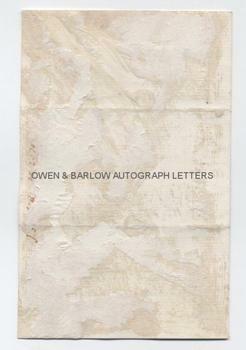 A few slight marks, one short tear at foot of fold line, residue from old mounting on verso of 2nd leaf. VG. 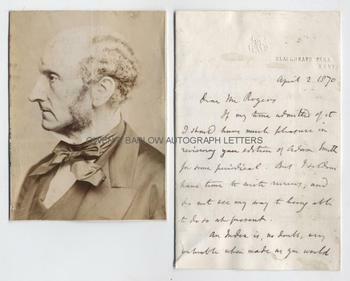 The photograph of John Stuart Mill is a contemporary 19th century albumen silver print measuring approx 5.5 x 4.25 inches and is laid down on card from album leaf. A good letter mentioning the two greatest works of John Stuart Mill, 'Liberty' and 'Principles of Political Economy' and also mentioning another great philosopher, Adam Smith. Rogers' edition of Adam Smith's 'Wealth of Nations' was published in 1869. John Stuart Mill was a supporter of womens' suffrage and actively campaigned for this. The Bill for the removal of disabilities on womens' rights to vote was passed on a second reading in 1870 but was then rejected following the opposition of William Gladstone. Both the letter and the photograph are from a 19th century collection made by the radical Liberal M.P., William Woodall, who was also an active supporter of women's suffrage and one of the introducers of the Bill. There is a later letter of John Stuart Mill to Rogers (15th April, 1870) published in 'The Collected works of John Stuart Mill' (1991, xxxii, 219) but, so far as we can establish, this letter is unpublished.